has proven ability to conduct high quality, unbiased wildlife population surveys. VAR is a small, women-owned business founded in December 2000 specializing in wildlife surveys by using an airborne infrared sensor or forward-looking infrared (FLIR). VAR is certified as a Disadvantage Business Enterprise under the Federal Highway Administration as administered by the Idaho Department of Transportation. is committed to client satisfaction with personnel who are highly qualified in all facets required to conduct the survey and analysis including aviation, aerial infrared, wildlife surveys, analysis and mapping. We will bring equipment and personnel to meet the project requirements. We provide expertise to provide high quality products on schedule and at reasonable rates. Safety is our priority for all wildlife surveys. We provide accurate, precise, and unbiased data collection for reliable, replicable wildlife population estimates. Our staff has conducted infrared surveys for a range of species including: moose, caribou, elk, white-tailed deer, mule deer, bighorn sheep, pronghorn antelope, wild horses and burros, Alaskan brown bear, canine, sage grouse, turkeys, and polar bear maternal dens. We have work in a range of vegetation cover types including: steppe, shrub-steppe, eastern deciduous forests, mixed forests, subalpine fir, coastal pine barrens, Douglas-fir forests, mixed conifer forests, juniper, and snow pack. We have conducted training sessions on the use of infrared (IR) for wildlife applications nationally and internationally. can evaluate the accuracy of prior wildlife surveys through investigation of methods of prior data collection and analysis. 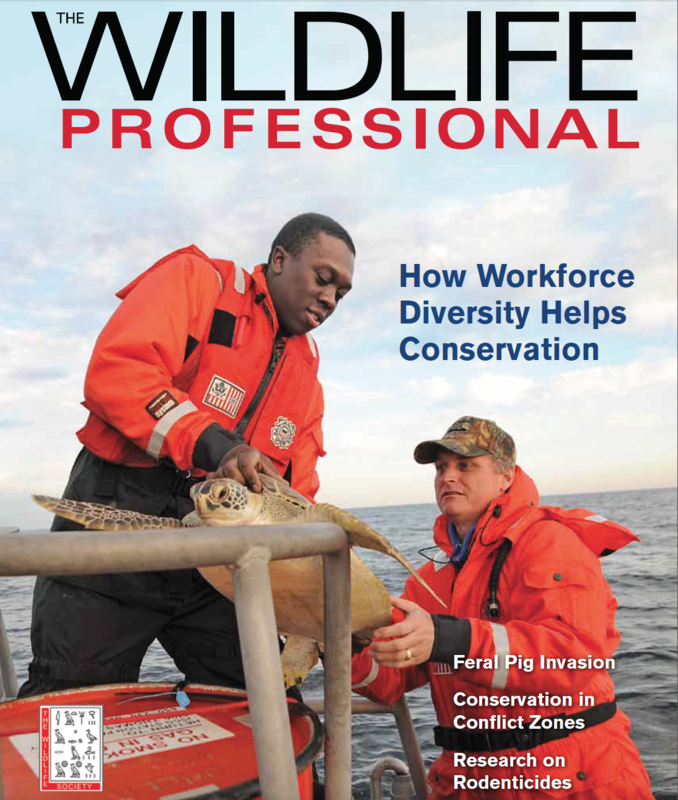 We have a Certified Wildlife Biologist on staff with over 20 graduate credits in statistics who conducts the surveys. We have conducted targeted research on variables that may influence detection rates of IR on wildlife populations using known animal groups. 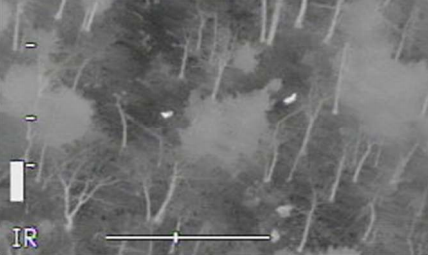 has designed and conducted aerial infrared deer surveys for a wide range of federal, state, and local government agencies. 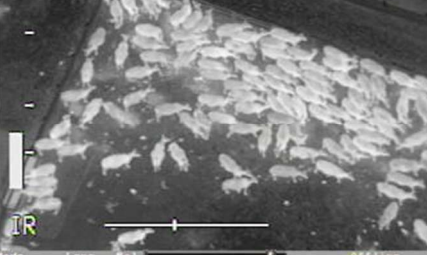 We have conducted aerial infrared wildlife surveys for the US Fish and Wildlife Service, US Army COE, Air Force, National Guard, Bureau of Land Management, US Forest Service, National Laboratories, Parks Canada, numerous state and provincial wildlife, parks and natural resource management agencies, counties, municipalities, universities, not for profit organizations, corporations, and private land owners. The US Army COE and National Guard Bureau both contracted with VAR to conduct multi-year surveys for population trend analysis. has conducted FLIR surveys for wildlife on over two million acres across North America. We have a survey team with experience in conducting FLIR surveys for large mammals across the US. We have conducted aerial infrared surveys in the vicinity and within Class B airspace in coordination with tower operations (e.g. Class B airspace in New York City). This requires patience and cooperation to get the weather conditions we need for a good infrared survey within safety parameters required in this airspace. 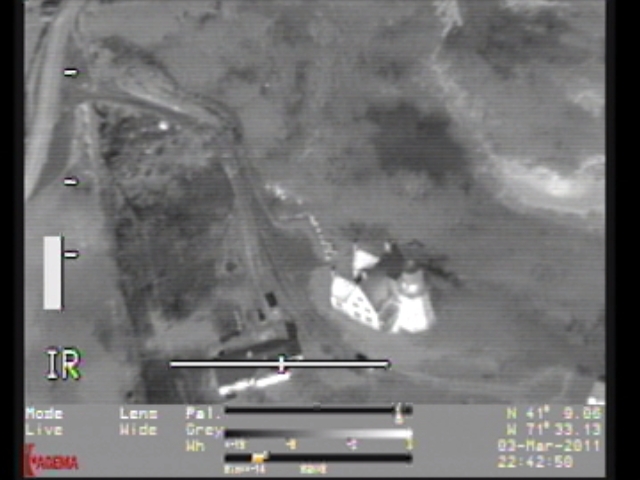 We have also conducted wildlife surveys on active military ranges with air-to-air exercises. Our airplanes and pilots meet the requirements of the Department of Interior and Office of Aircraft Services and meet all FAA, Transport Canada, and NAFTA commercial operating and licensing requirements. We can see the deer’s ears. Our FLIR is housed in a 4-axis gyro-stabilized gimbal mount on the wing of our Cessna 206. The gyro-stablized gimbal houses both an IR and natural color camera. The gimbal allows 330o of azimuth and 90o of elevation allowing us a wide range of angles. Oblique and nadir (straight down) views are available. 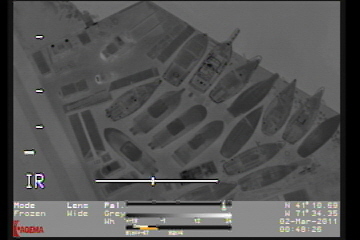 Both the IR and color camera provide geo-referenced video and still images. Geo-referenced video and images can be imported into GIS through an ESI shapefile. Supporting images are linked to the data collection point. The FLIR is long wave (8 – 12 microns) that provides exceptional image clarity and superb solar immunity. We used a PolyTech Kelvin 350 II (Sweden). The IR sensor installed in the gimbal is the high resolution Agema Thermovision 1000. It has 800 x 400 pixels providing superb resolution and the ability to determine animals by their morphology or body shape. 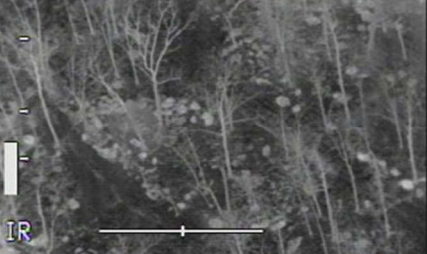 The minimum detectable thermal resolution is less than 1o C that means it can detect objects that are only a degree Celsius different from the background. It has a wide (20o) and a narrow (5o) field of view (FOV). At 1,000 feet above ground level looking straight down using the wide FOV, the footprint or area covered by the sensor is 360 ft. x 234 ft. while the narrow FOV provides a footprint 90 ft. x 59 ft. Swath width of up to 0.5 mile is possible for ungulate surveys. staff has experience using a wide variety of long- and short- wave FLIR systems on both helicopters and fixed-wing platforms for wildlife surveys. FLIR systems used include: Star SAFIRE, SAFIRE I, SAFIRE II, FLIR 2000, FLIR Mark 3, WesCam DS-16, Polytech Kelvin 350 II, and other hand-held systems. More importantly, we specialize in the use of this equipment for wildlife surveys. © 2019 Vision Air Research.